Hadrian’s Wall stands as an emblem of the turbulent history and the rich heritage of Northumberland. Today the fortifications and countless castles are peaceful and the expanses of countryside they stand in are perfect for mountain biking, walking, cycling and, of course, camping. Kielder Forest Park and Northumberland National Park compete with the staggeringly beautiful heritage coast for visitors’ attention. 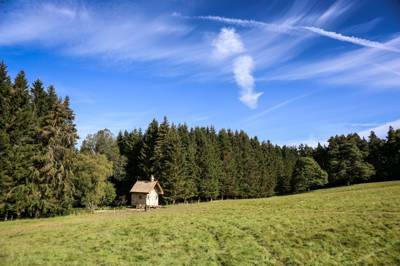 Each offers plenty to see and do along with camping and glamping sites which embrace the scenic surroundings. We’ve hand-picked the very best of them for the Cool Camping collection. Amazing beaches, magnificent castles, remote hills and unpolluted night skies make Northumberland a great place for a camping or glamping holiday. This north-eastern county is bounded by the Scottish border, Hadrian’s Wall, The Pennines and a stunning stretch of coastline. Everywhere you look there’s something to explore from the wild countryside of Northumberland National Park to mysterious Lindisfarne Island. Whether you like your holidays to be relaxing, active, filled with culture or based around wildlife watching, Northumberland ticks all the boxes – and camping really helps you make the most of the stunning scenery. Woodland camping, wild camping and waterside camping all feature among our selection of the best campsites in Northumberland. Our sites are hand-picked using stringent criteria – but that doesn’t mean they are all the same. Our collection of camping and glamping sites in Northumberland ranges from tents-only campsites to top-of-the-range glamping sites. There are places which are family-friendly and places which are strictly adults-only. What they all have in common is difficult to put your finger on but for the most part they are smaller sites which are independently owned and often owner-run. We look for places that are likely to charm and please with their appreciation of the great outdoors and little touches that make camping holidays memorable. 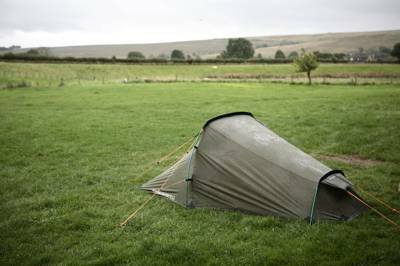 From backpacker camping to family-sized pitches with electric hook-up, there’s a type of tent camping to suit every camper in Northumberland. With a national park and two national trails (the Pennine Way and Hadrian’s Wall Path), walkers have been looking for places to pitch up in Northumberland for decades. There are simple sites near the paths that have sprung up to meet this demand. Whether you’re on the trail with a one-man tent in your backpack or just want to pitch your tent in a scenic spot, these often back-to-basics sites can be just what you’re looking for and they tend to be the type of places we love. 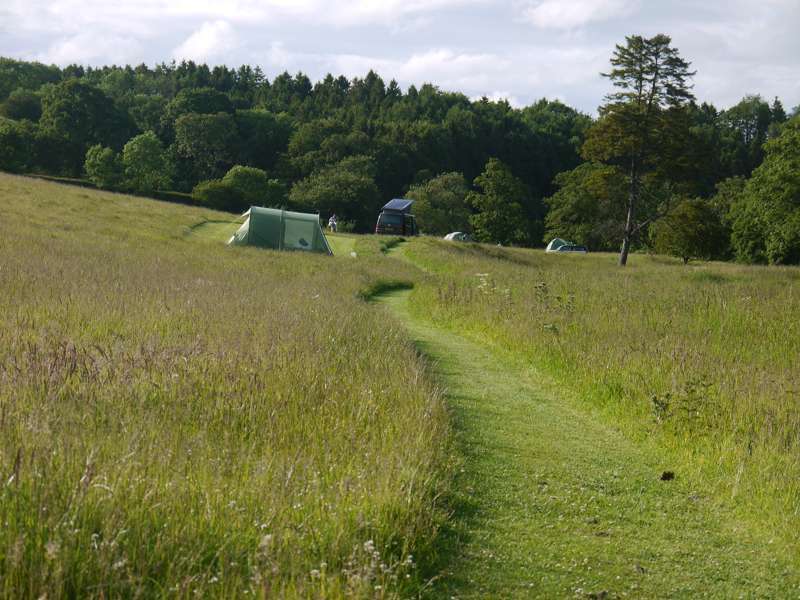 Classic camping in a tent is the lowest impact kind of holiday you can have, which seems appropriate in the wilds of Northumberland; where the scenic beauty of the place will probably have been one of the deciding factors for your visit. It also allows you to be fully immersed in nature and the landscape. You can sit out under the starry skies, fall asleep to the sound of wind or waves and wake to birdsong. And you only need to unzip your tent to start enjoying the views. Part of the beauty of camping, in our opinion, is getting back-to-basics but that’s not to say our range is limited to tents-only sites. We also include classic campsites where you can park up in a campervan, caravan or motorhome and there are sites with electric hook-ups and plentiful facilities too so, however you like to camp, the collection should have something to suit. At the upper end of the camping scale is glamping. There are a handful of glamping sites in Northumberland that have caught our travel experts’ attention and made it on to our hand-picked shortlist. Glamping accommodation can range from tents that have been pre-pitched for you to bespoke treehouses, shepherds’ huts and cabins. It all comes under the umbrella of luxury camping as it offers ready-made accommodation and makes camping easier. 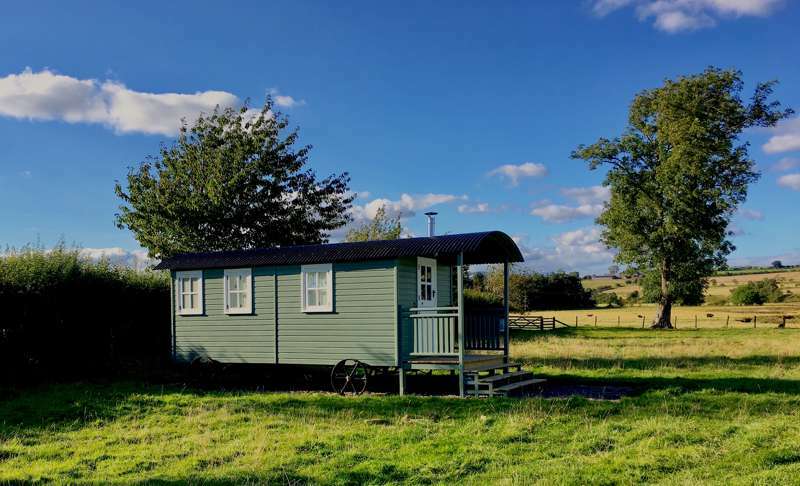 Sometimes glamping accommodation is provided alongside pitches for regular tents – a sort of first-class section of the campsite, sometimes it’s on a glamping-only site. Either way these can offer the same kind of sociable feel as a regular campsite with shared spaces and facilities. But sometimes glamping accommodation is offered as a stand-alone pitch or at a place with just one or two units where seclusion and privacy are part of the experience. Glamping can be a treat for regular campers and a blessing for novices who can try camping without having to invest in their own tent. With glamping you don’t have to pack the car to the roof rack and you don’t have to pitch the tent. After that, the levels of luxury really depend on the individual glamping site. Some places simply offer a shelter and let you make it your own and some places are stylishly decked-out with luxury sheets, fluffy towels and complimentary toiletries – more like a boutique hotel than a traditional campsite. England’s most northerly national park, Northumberland National Park is situated in the north west of the county and meets the Scottish border. It feels as remote as it sounds with mountains, moorland, rivers and wild mountain goats on the edge of the Pennines. It also includes a section of Hadrian’s Wall. Designated in 1956, it is famous for great walking with part of Hadrian’s Wall Path and the Pennine Way National Trails passing through. The latter provides a route up to the national park’s highest peak, the Cheviot, at 815 metres. You don’t have to be on the epic 268-mile walk to appreciate the views from the top which can stretch all the way to the Lake District on a clear day. Running, climbing, mountain biking and horseriding are all popular and possible ways to explore the landscapes. The national park blends seamlessly in to Kielder Water and Forest Park in the south where there are plenty more opportunities for outdoor exploration. There are 250 square miles of working forest here along with northern Europe’s largest manmade lake so adventures on land and water are all possible. You can find out about all that’s on offer with a visit to one of Kielder’s three visitor centres at Tower Knowe, Kielder Waterside and Kielder Castle. The park also has an observatory which makes the most of the area's designation as an International Dark Sky Reserve. It is, in fact, the largest area of protected night sky in Europe and the classification recognises the efforts to limit light pollution so that the stars can be seen in all their glory; perfect for camping trips. If you’re planning a Northumberland camping trip and you’re not visiting the national park, you’re probably headed for the coast. There's about 60 miles of shore on the eastern edge of Northumberland and half of it is part of a designated Area of Outstanding Natural Beauty. The Northumberland Coast Path traces the whole coast from just outside Newcastle to the Scottish border. It has dune-swept beaches, fantastic wildlife, coastal castles and seaside resorts. From England’s most-northerly town, Berwick-upon-Tweed, down to the classic seaside resort of Newbiggin-by-the Sea in the south there’s plenty to see and do here. You can go rockpooling in Cresswell Bay, build sandcastles at Druridge Bay or walk the dog at dog-friendly Warkworth. Call in to Craster for local seafood and find photo opportunities galore at Bamburgh, where the beach is overlooked by an iconic castle. One of the most famous places on the Northumberland coast is Lindisfarne. Some people flock here for the birdlife which gathers on the mudflats of Lindisfarne Nature Reserve, but many more make a pilgrimage to the tidal island and its ruined priory. Linked to the mainland by a tidal causeway, the island is cut off by sea water twice a day. It was an early centre of Christianity in Britain, where the Lindisfarne Gospels, one of the most important books in English history, was produced. Lindisfarne Priory and the nearby castle are undoubtedly one of the most-visited historic sites in Northumberland – but they are far from the only ones. This north-eastern county at the frontier between Scotland and England saw centuries of conflict, resulting in more than 70 castles and the greatest reminder of Roman Britain, Hadrian’s Wall. 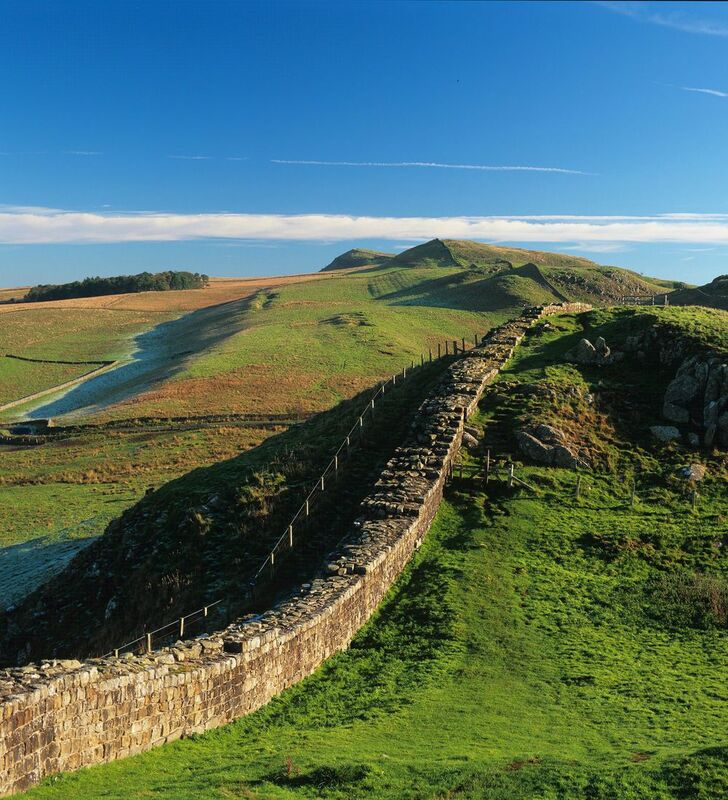 Now a UNESCO World Heritage Site, Hadrian’s Wall was the edge of the Roman Empire and remains remarkably intact 2,000 years after it was built across some of England's wildest countryside. You can see the remains of forts and learn more about Roman life on the wall at Housesteads and Chesters where there are English Heritage visitor centres. There’s more Roman remains at Corbridge Roman Town, a couple of miles south. It can be difficult to know which of Northumberland’s many castles to visit on a camping trip, which is why we’ve written a separate guide to Eight of the Best Northumberland Castles. Among them, is Alnick Castle. This magnificent Norman castle is likely to keep all the family happy with its huge range of attractions. Not only does it have the chance to explore state rooms, grounds and gardens but it has an impressive collection of artwork. And if these genuine historic treasures are a bit much for the kids to take in – there’s always the fact that the castle was used as Hogwarts for the Harry Potter films. There’s a changing programme of events and activities but expect some wizard-themed fun with the like of broomstick lessons. The castle at Berwick-upon-Tweed is a little less grand and now in ruins – but has a no-less interesting history. You can see what remains of it on a walk of the town’s Elizabethan ramparts. The walk also gives you great views and leads you to an exhibition in the historic barracks which explains how the town changed sides 13 times during the border wars between France and England. If that’s not enough inspiration for your Northumberland camping or glamping trip, take a look at our post on Must-See Historic Sites in Northumberland. Northumberland at Campsites in Northumberland, Camping in Northumberland? Find the best campsites in the north here, with this specially chosen collection by the experts at Cool Camping. Whether you’re pitching your tent, parking up a campervan or looking for a luxury glamping experience, these incredible Northumberland campsites are sure to offer the perfect inspiration for your next camping adventure.